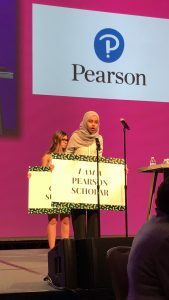 I have always been one to toss my hijab in the ring for any scholarship opportunity and hope for the best. Imagine my surprise and excitement when I received the call from Pearson saying I had gotten theirs. Through the Phi Theta Kappa scholarship portal, applicants are able to apply for multiple opportunities via one application. I had completely forgotten about the Pearson scholarship, one that would eventually expose me to some of the best people and experiences in my life. Up until that point everything had been going great for me and this just seemed like the perfect icing on an almost perfect year. The mentorship component along with the Pearson textbooks included made this the opportunity of a lifetime. I was ecstatic and couldn’t wait to see who I would be paired with. Up until that point all my mentors had been people that were similar to me in one way or another. The Pearson Scholarship mentor program is a virtual one; my mentor and I would meet monthly via video calls. A few weeks after the initial congratulatory email, I received a second one that contained the name and preliminary information about my mentor. I looked at her name, location and job title and I really didn’t know what to make of it. We were so different and my thoughts were all over the place, “What’s an English Portfolio manager?” “Upstate New York? 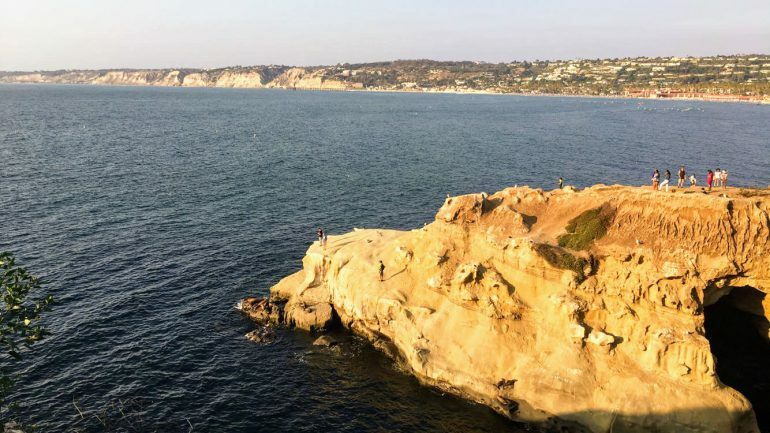 That’s a long way from San Diego!” I spent the time between then and our first video meeting trying not to let apprehension take over as it usually does when I’m put in a situation I can’t control. How would we connect? Would we even connect? As soon as I met my mentor, Sherri, my apprehension went away. We started sharing more and more of our lives. We talked about our families, our childhoods, and our education/career journeys. We bonded over our mutual love for the ocean, the sun and everything California. She may not have known it, but she became my motivator. We developed a routine of bouncing thoughts and ideas off of each other. When I was trying to transfer, Sherri cheered me on and I was able to get through it. During the internship application season, Sherri looked over my resume and cover letters and helped me put together a coherent application. When I got rejected by a school I thought would be the best option for me at the time, Sherri reminded me of the other incredible opportunities I already had and helped me see the bright side of a heartbreaking situation. Our differences are a bigger asset than I initially thought and have given me a different perspective than the one I was already used to. The Pearson experience in general has been one that has taught me the value in surrounding yourself with people that you wouldn’t naturally interact with in school or at work. Thanks to this new found openness I have met and connected with people in the business and sales world through attending the 2018 Pearson national sales meeting last summer. I have connected with students pursuing careers in tech, music, education and health care. I have been able to effectively exchange ideas with people so different from me as well as articulate my thoughts and ideas to superiors and peers. I have become a person who can take a heartbreaking situation and from it create something beautiful and hopeful. Thanks to 1 year with Pearson, I’ve become ‘Me 2.0’ and I’m excited to see what comes next. Pearson Students: What or who has motivated you? What have you learned? Share by commenting below! Hanan Ali is a junior majoring in bioengineering at the University of Toledo. Being a transfer as well as an international student, Hanan has always had to adjust very quickly to new environments. She now enjoys learning at the intersection of Engineering and Medicine which challenges her to think outside the box and exposes her to new thought processes and ideas. New to Toledo, she’s constantly working on adopting the mid-western mindset and using it to her full advantage to achieve her goals. 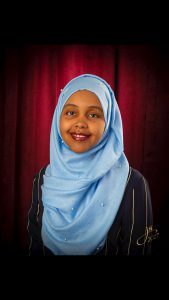 Hanan is a 2017 recipient of a Pearson Scholarship for Higher Education. This is Hanan’s second publication on the Pearson Students Blog. If you are a college student and interested in writing for us – click here to pitch your idea and get started!